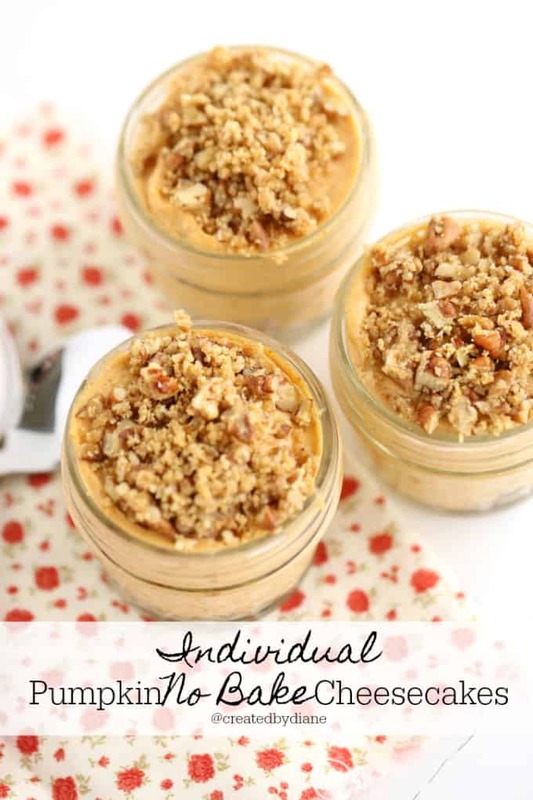 Oh my goodness, you will want to grab some jars quickly and whip up this recipe. You’ll love how quick it is! and get every delicious recipe delivered to your inbox. 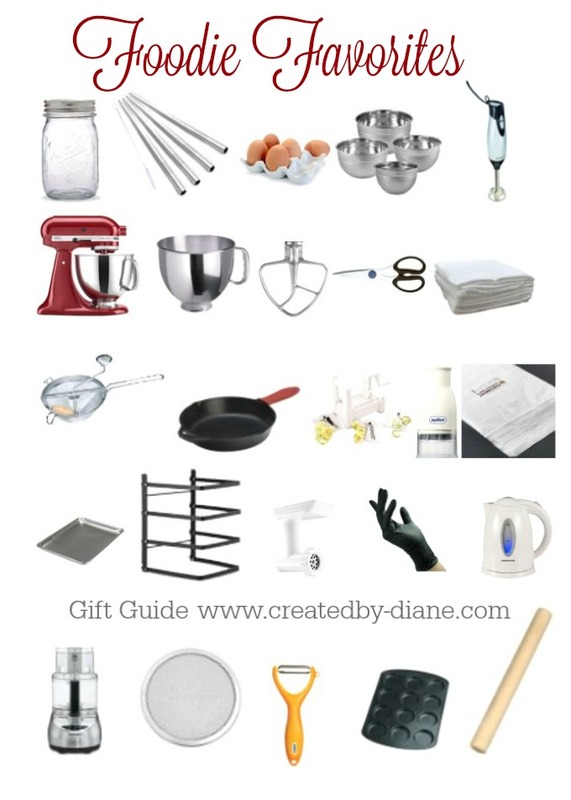 Plus get my FREE e-cookbook. Click here. 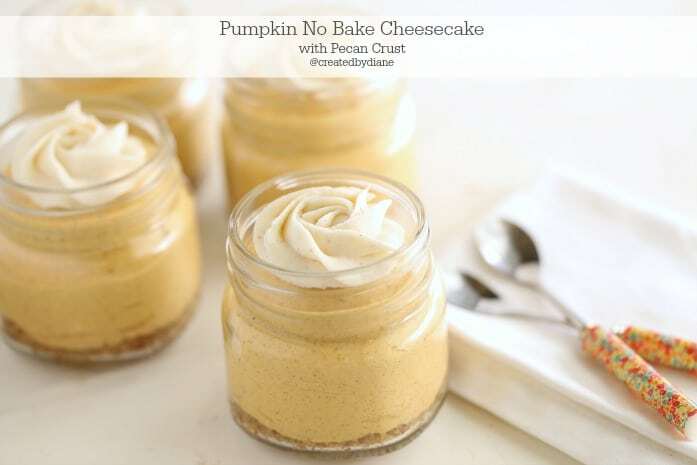 If you love cheesecake, you’ll love this. The crust is so incredible, you can even make a double batch and layer it within the cheesecake. Now, the really interesting thing is I gave of these to a non-pumpkin lover (I’m not sure how that is possible, but it’s true) and they LOVED it and they told me to hurry up and post it so they can make it! I do think some people relate pumpkin to “pumpkin pie” and there are OH SO many more delicious recipes made with pumpkin that don’t taste like pumpkin pie at all. 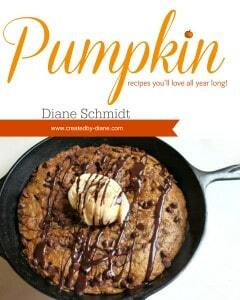 Take a look at my PUMPKIN E-book for more great pumpkin recipes. In the bottoms of the jars is this delicious crust. 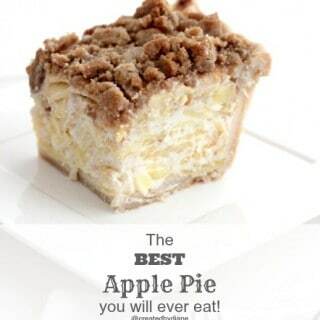 It’s a mixture of pecans and graham crackers crumbs. It’s irresistible! No matter what you make them, they will be devoured. These were made in 8 oz jars. This recipe makes 4. This is a generous serving. If you prefer a smaller serving size. They can be made in 4 oz jars or cups. 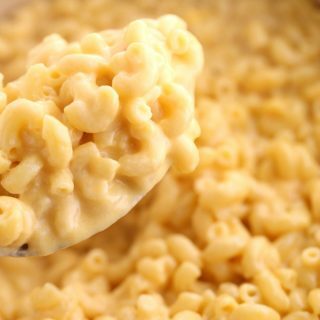 This recipe can be easily doubled to accommodate more servings as well. I piped buttercream frosting mixed with pumpkin pie spice on top of the cheesecakes. The lids fit on top nicely without messing up the rose design. You can see how I pipe the rose shape and buttercream recipe here. 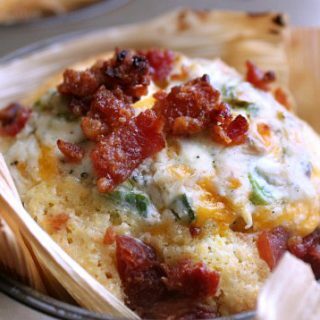 These have the “crust” put on TOP!!!! They taste fantastic and each time you dunk your spoon into the cheesecake you’re sure to get some of the nuts and graham cracker mixture. The choice is yours how you’d like to serve them either way they taste great! 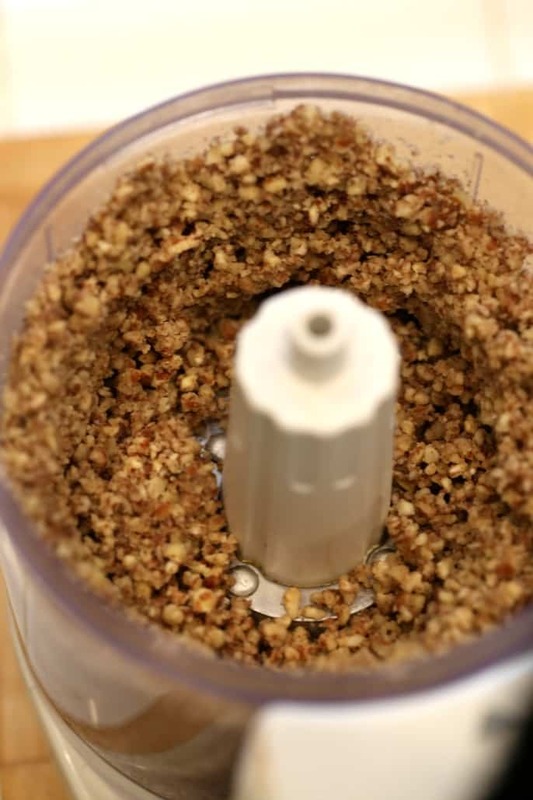 In food processor grind nuts, then add in graham cracker crumbs and butter and grind until fully blended. Place 2 tablespoons in the bottom of each jar. With a mixer and the wire whisk attachment, whip cream cheese until smooth and creamy. Then mix in the pumpkin puree. Next pour in heavy cream and whip on high until well mixed and fluffy. Mix in pumpkin pie spice. Place mixture in a gallon plastic bag to fill jars without a mess. 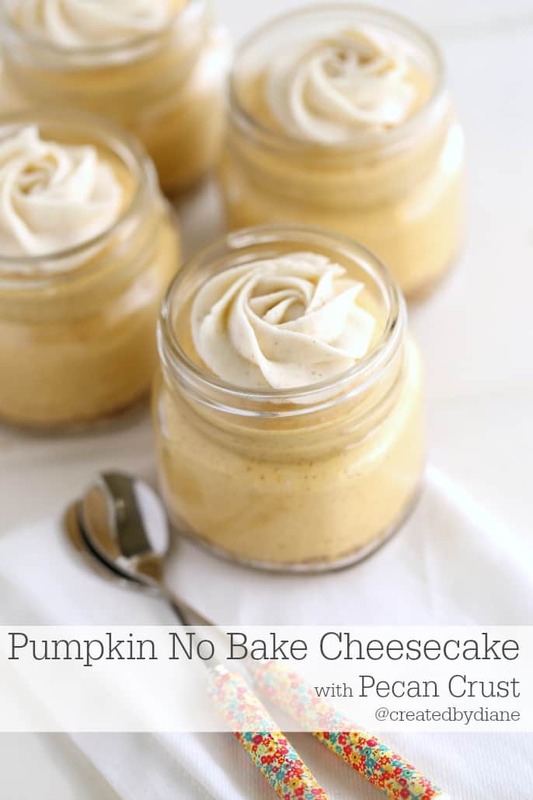 Fill jars with pumpkin cheesecake mixture. Top with frosting or whipped cream. I used buttercream frosting with a small amount of pumpkin pie spice added and piped the rose with a 2D tip. The lids fit on the jars with the frosting. 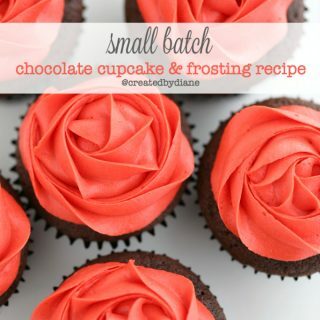 These are exquisite — I’m off to see how you piped that frosting, I love it! These sound lovely, but am I missing something? There’s no pumpkin in the recipe? Oh my goodness that will teach me to type things up at 1 am. I adjusted the recipes. Thanks so much for pointing that out. The recipe needs a cup of pumpkin puree 🙂 It’s amazing how I can read things over and over and still miss errors! Thanks for the speedy reply! And, Diane, I do the same thing with grocery lists- I go to the grocery with 10 things on my list, check it three times before checking out, then get home having somehow forgotten the one thing on the list I needed most! Go figure! I love anything in a jar! 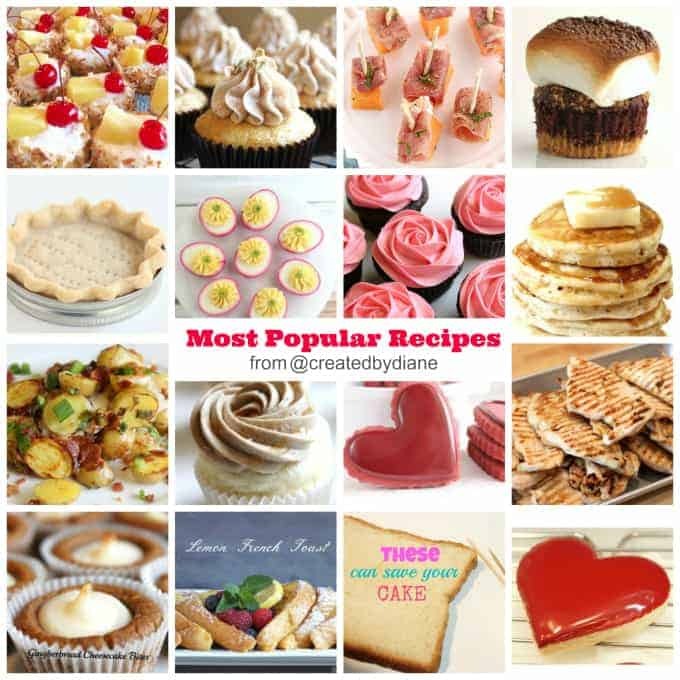 These are gorgeous Diane – love your creative touch with the piping bag – beautiful! 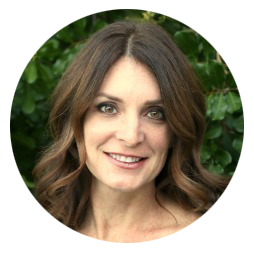 I love these Diane, just so darn pretty! Pinning!